If someone told me I would be treating farm animals after graduating from veterinary school, my response would have been “When pigs fly!” However, there is a new trend in exotic companion animals that is making me eat those words. 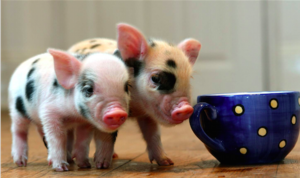 Teacup pigs??? Are they for real? Back in the 1980s, Vietnamese pot-bellied pigs came into the pet trade. Although they are considerably smaller than their farmyard counterparts, which can reach over 500 pounds, these indoor companions can still grow quite large – some reaching over 150 pounds. During that trend, many of these pigs outgrew their comfortable homes and were relinquished to shelters and rescue groups. Pigs are a long-term commitment. They can live 15-20 years. They require annual vaccinations and regular veterinary care, just as a dog and cat would. They have dental care needs, both at home and with a veterinarian. They can shed and require hoof trims to meet their grooming needs. · Part of the appeal of mini-pigs is that they are very clean animals. They are easily house-trained and can learn to use doggy-doors. They can even learn to ring a bell to signal their human companions to let them outdoors. Pigs are very intelligent animals. They form very strong bonds with their human companions. They are very affectionate animals. Their clever and playful personalities are very endearing, however, if they are not trained and kept entertained, they can become dominant and even aggressive. · Part of their normal behavior is to root. This can be bothersome if they upturn rugs indoors and plants and landscaping outdoors. The best way to deal with this is to give a pig an acceptable place to root and hide treats and food to allow for normal rooting and foraging behavior. If these needs are not met, your pig will get bored – and bored pigs can get very destructive. Even though I never imagined working with swine on a regular basis, they are fun and intriguing companion animals that bring new challenges to the practice of exotic pet medicine!